Hubsi (Hubert) Kramar is a Vienna based actor and performer whom I had never heard of before the year 2000. In that year however he made his debut on the world stage by appearing at the reception of the yearly “Opern Ball”, dressed up as Adolf Hitler in full Nazi regalia. This in protest of the then right-wing government led by Jörg Haider. He was swiftly arrested and bundled away, for all the world’s news camera’s to see. 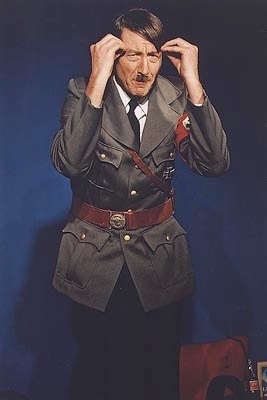 Hubsi has specialised in portraying Hitler (for instance here with the Publix Theater Karavan 2001). Attached to the third picture on this page is an MP3 containing a “Hitler Rap” by Hubsi which I plucked off the net shortly after the 2000 incident. It is as gruesome as it is well done in my opinion.